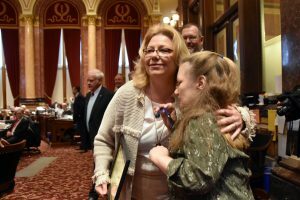 Senator Pam Jochum of Dubuque and her daughter, Sarah, in the Iowa Senate Chamber on March 20, 2018. “As we mourn Sarah’s passing, our family is also celebrating the impact that Sarah had for 41 years on our lives and the lives of so many Iowans. “Sarah taught all of us about unconditional love. “Sarah loved everyone and touched so many hearts. 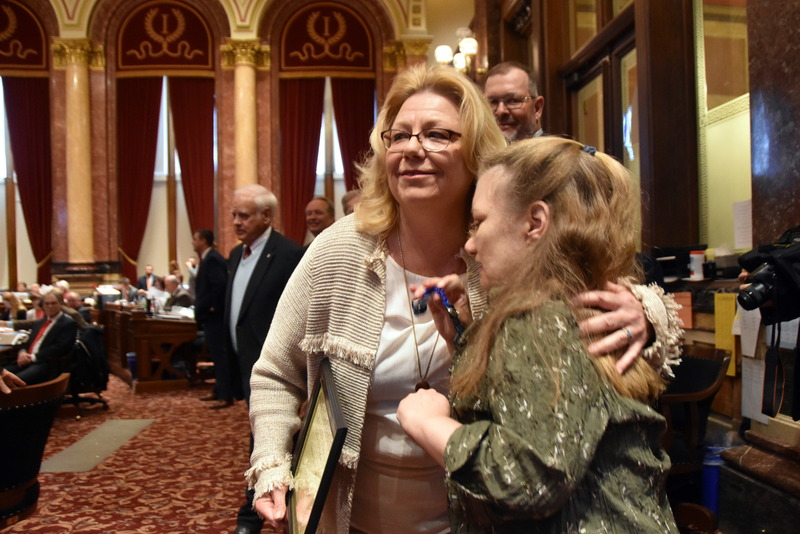 “People who met Sarah were moved to help their fellow Iowans through such careers as nursing, social work and special education. “Because Sarah had a parent in the Legislature her entire life, she made an impact on Iowans in other ways. She helped us bring an advocacy and a passion to the Capitol that continues today. “Even in death, Sarah is creating new, life-changing stories because her organs will be donated to recipients across the country. “Our entire family sends out a big ‘thank you’ to Iowans and others for their outpouring of support during this difficult time.